As a congregation that stands proudly in the tradition of the Protestant Reformation, we are grateful for an opportunity to remember God’s gracious kindness to His Church around the anniversary of the Reformation. On the Sunday closest to October 31, the day history tells us Martin Luther nailed his famous 95 Theses to a church door in Wittenburg, Germany, we pay special attention the details of the Reformation. Our worship service will take special care to reflect the liturgies of the Reformed tradition of Christianity, especially in the songs and arrangement of psalms that came out of this historical era. Then, be sure to join us later that afternoon at 3pm for a special service and lectures on how the precious truths of the Reformation that were recovered can challenge, equip, and impact Christ’s church afresh today. Keep your eye open for further details as they become available. We hope you’ll join us to find your own faith challenged and strengthened, to the glory of God alone! 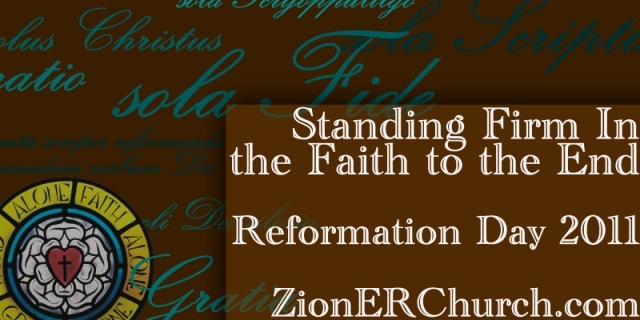 This entry was posted in news and tagged Reformation, Reformed theology. Bookmark the permalink.